Reviewing scholarship applications, informing the winners and writing this post is one of the highlights of the year for me and all of us here at Floret. Over the last ten days, the team and I have been pouring over all the scholarship essays and narrowing down the list of top candidates. With so many applications to read, we recruited additional outside reviewers to participate in the process. Joining the review team this year were four Floret Workshop alumni, including two past scholarship winners! 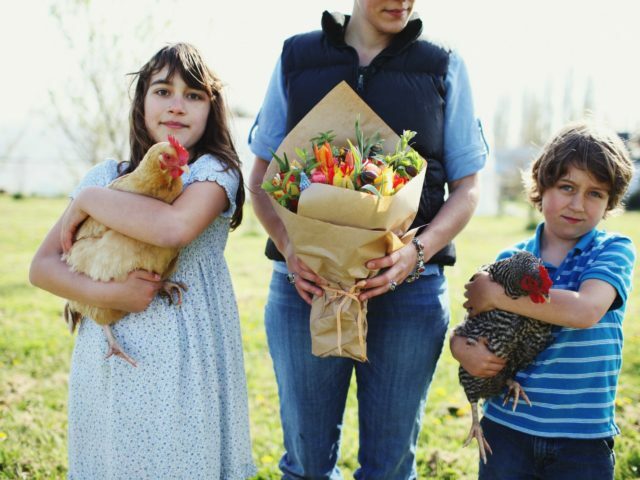 These ladies all know what it takes to be a successful farmer-florist and are great at spotting applicants with the potential to thrive with a little help from Floret. I was blown away by the number of applications we received this year. A record breaking 3,107 individuals from all 50 U.S. states and 65 countries applied for a spot in our upcoming Floret Online Workshop. Wow! 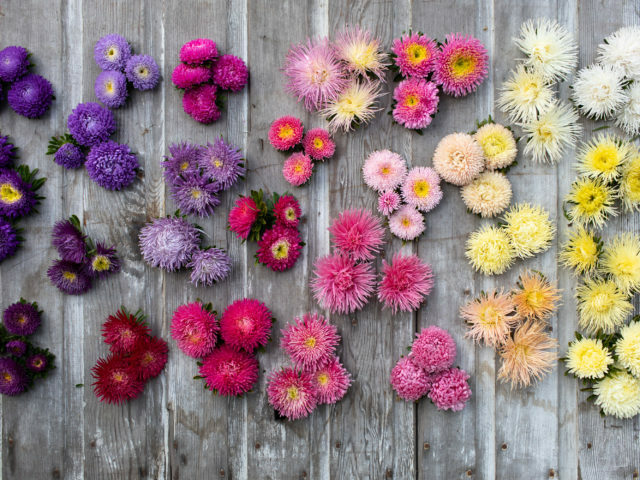 What an incredible testament to the growth of the seasonal flower movement and the level of interest in small-scale flower farming all around the globe. We had to burn the midnight oil in order to read through all the applications and choose the top 50 finalists. From there, I printed out the thick stack of finalists’ applications, curled up with a big ole’ cup of coffee and read and re-read each of the finalists’ essays. It was refreshing to focus on the hope, beauty and joy that flowers bring to others and the inspiring stories from around the globe of people who aspire to cultivate more beauty through seasonal blooms. What was even more inspiring was the commitment by so many applicants to continue to pay it forward and help others along the way. It affirms, once again, that the flower community is made up of some of the kindest, most generous people around. The review team selected many incredible and deserving finalists, which made the decision-making process excruciatingly difficult. Choosing just six felt impossible. But to my surprise we had a few generous souls who stepped forwards and gave the gift of two additional scholarships, for a grand total of eight! I’m so amazed and humbled by these incredible acts of kindness. Before I introduce the winners, I want to first express my gratitude to each and every person who took the time to apply for the scholarship. I am honored that you shared your aspirations, your dreams and beautiful life stories with us. I appreciate, the opportunity to read so many thoughtful essays, family memories, personal journeys and life stories. Serving as an example for children. I was struck by the many mothers and grandmothers (and even more fathers and grandfathers than past years!) who were inspired by their children to apply. The intense desire to share the experience of growing gardens and farming together as a family and to serve as an example to kids, grandkids and future generations is a powerful motivator for many. Encore careers. We received more applications than ever before from folks ready for a career change and/or nearing retirement. Still youthful, active, and engaged, this group is itching for a change, contemplating the next chapter of their lives, and getting ready to dig in and pursue their passion as a second career. Healing and helping others. Many essays shared, often in heart-wrenching detail, the many ways gardens have provided comfort in the wake of loved ones lost, broken marriages, addiction, disease, disaster and shattered dreams. The number of applicants impacted by hurricanes, fires and other impacts of a changing climate was significant and sobering. I also was struck by the number of applicants who want to start gardens, farms and businesses as a way to help others in need. Many of these raw, heartfelt essays had a common theme: life is short and precious. A quest for confidence. More than a few essays spoke of the need for courage and confidence to pursue a dream. We read many confessions of anxiety and self doubt. Many shared their fear of stepping away from something stable, but unsatisfying, in order to pursue something that bring you joy. We heard lots of excitement, laced with a lot of anxiety, about starting a new business or making a big change. Floret readers may note that last year’s winners were almost all international, while the newest winners are all domestic. Surrounded on all sides by sprawling development, Old Grove Orange is one of the last working farms in the Los Angeles basin. Owned by Aki Nakamura, the farm produces many kinds of citrus, and recently, mixed vegetables. The farm has been in Aki Nakamura’s family for five generations. While other farmers in the region have sold out to developers, Aki’s family has maintained the land in agricultural production. However, the farm now faces an even greater threat than development: the Asian Citrus Psyllid, an invasive species, which carries a bacteria that is fatal to citrus trees. “The Psyllid has now reached our grove and I expect that we will lose our 100-year old trees over the next six years. To not lose the farm, we started farming mixed vegetables four years ago, thinking that we could transition over to this alternate crop as the Psyllid gradually worked its destruction. But our experience with vegetables has been rough – nobody cooks anymore! And competition from meal kit providers, funded with silicon valley venture capital which enables them to lose money for years, is extremely severe.” Eager to save her farm and grow a product that her urban customers will buy, Aki is expanding into specialty cut flower production. And as both her parents are living with Alzheimer’s disease, Rosie is acutely aware of the importance of work you truly care about. Every day is precious. Many of the small towns scattered across West Virginia’s Appalachian mountain countryside are seeking to re-define themselves in the wake of the decline of the once-dominant coal industry. While some focus only the challenges; others residents, like Grazia Apolinares, are focusing on the positive and the untapped potential. “We could’ve left this place in search of better opportunities for our family, but instead of continuing a generational chain of land abandonment, we decided to dedicate our time and last resources here. We hope that by treating the land in a holistic way we will stay connected to it. 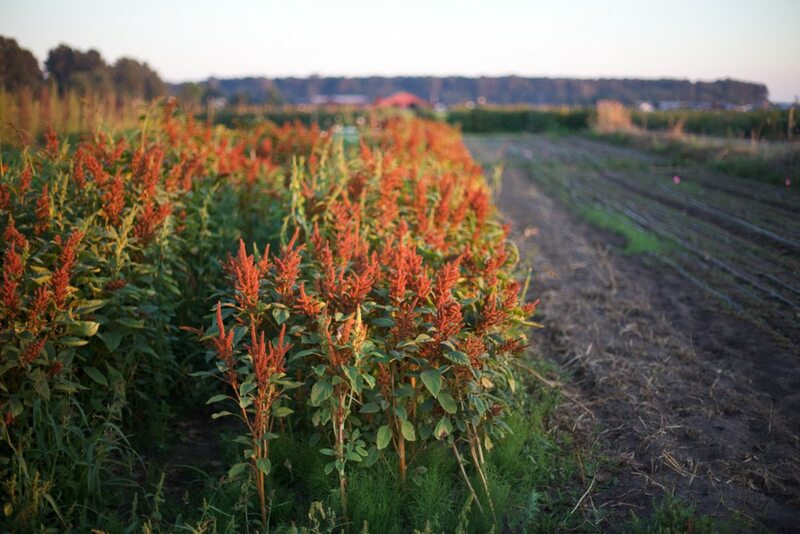 One of four owners of Bumbleroot Organic Farm, a small organic farm just outside Portland, Maine, Melissa Law started growing vegetables and flowers on two acres of leased land in 2014. Two years later, she and her partners purchased her dream farm. 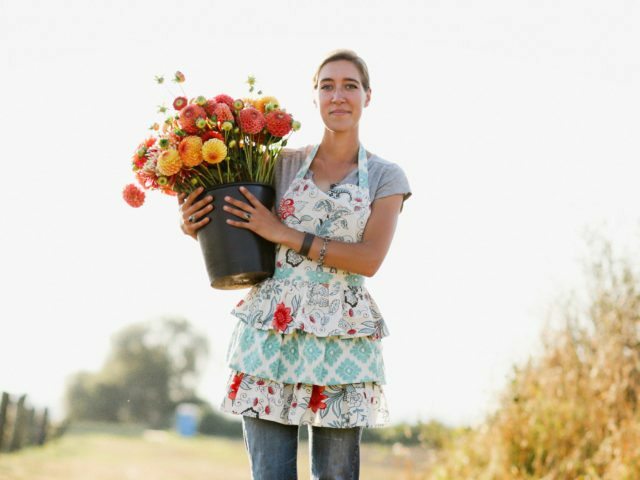 Committed to making a positive impact in her community, Bumbleroot donates veggies and flowers to local non-profits she has worked with since have starting the farm. “2018 was our first year dipping our toes into floral design beyond market bouquets, and it’s been a joy and a challenge. 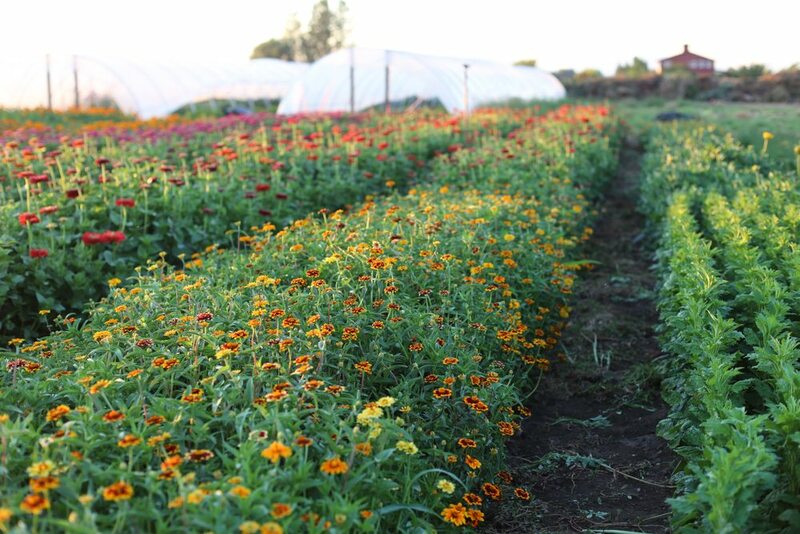 I believe it is possible to be a certified organic flower farm, to grow a diversity of flowers year-round (even in Zone 5! ), and that this workshop could help me achieve that goal,” Melissa shared. 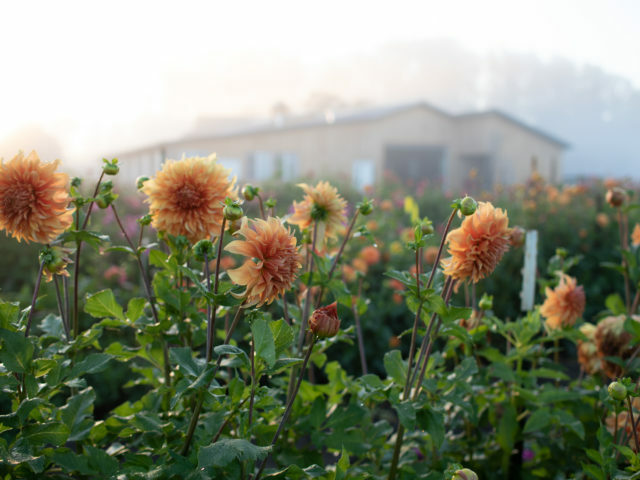 Proving that you’re never too old to start growing flowers, Susan expanded her garden and planted more than 200 dahlias plus many other flowers began selling them to flower shops and designers in her area this year. After the birth of their second child, Dinar and Julia Mukhamadeeva left the fast-paced city life in Moscow to start a new life in the countryside where they would have more space and time to grow their own food and flowers. Janie Beuthin lives in a city with one of the highest violent crime rates in the nation and where 41.9% of residents live below the poverty line. Over the past few years, lead-tainted water flowing from city waterlines has brought worldwide attention and condemnation and potential long-term health impacts to children and families living in this hard-hit city. While some families decided to move away, Janie buried her roots even deeper into Flint. Together with her husband, three young kids and a garden cat, Janie created Twig End Farm, a small urban flower farm on two city lots just minutes from the heart of downtown. The farm now supplies flowers to a local eatery and arrangements to nearby shops and special orders. For the past three years, Mike Brolio has been running a therapeutic farming and gardening program for adults with autism and intellectual disabilities as part of the Horticulture Program at the Charles River Center. Individuals involved in the program gain and develop many physical and therapeutic benefits including development of fine and gross motor skills, strength building, increased awareness of nutrition, increased communication and team-building, stress reduction, increased social interaction and gained sense of responsibility and accomplishment. Determined to create something beautiful in the aftermath of the destruction and devastation brought by Hurricane Maria, Kelly Kellogg Gonzalez planted a garden. With the help of volunteers, Kelly cleared and converted a lot previously rented for her now shuttered food truck and planted zinnias, cosmos, amaranth, basil, dill and other pollinator-friendly plants. When Margaret Gino’s children were born, she created a garden for each of them with specific flowers capturing who they were in the botanical world. “I would read The Lupine Lady to them more times than I’ll ever know. From this book I found one of my life’s goals, ‘You must do something to make the world more beautiful’, I knew then it would be through flowers. Twenty-five years later, creating many gardens along the way, I’m recently divorced and find myself just getting back to living and pursuing my gardening passions. This is where I truly am ‘alive’ and at peace. “Unexpected twists are part of the beauty of life, but I’m learning they are less than ideal in a cut flower,” reads the opening of Michael Card’s essay. In 2016 life took a turn for Michael which brought his professional career to a halt. But having some land to work with, and years of gardening experience, Michael decided to make the most of his love for the outdoors and his desire to care for the community by opening a small roadside stand and sold veggies and fruit. Located on a busy road, and in a community that appreciates fresh, locally-grown food, Michael’s stand did well. After reading Cut Flower Garden over the winter, Michael decided to dedicate part of his field to flowers. “Unexpectedly, I have enjoyed growing them far more than the fruit and veggies,” he shared. His customers eagerly bought up virtually every stem he offered for sale. Please join me in congratulating our 2019 Floret Scholarship winners, the first official members of the Floret Workshop Class of 2019! If you’d like to join these scholarship recipients to participate in the Floret Online Workshop, our 6- week small scale flower farming course, be sure to mark your calendar, as enrollment opens October 11th! Thank you, again, to everyone who completed a scholarship application. Your stories inspired every member of the team in ways you can’t even imagine. Finally, I want to express my heartfelt gratitude to the anonymous donors who generously sponsored additional sponsorships. Wow. Our hearts are full. Wow! I am humbled and heart-warmed by the impact of Floret and the joyful enrichment of flower lovers everywhere! What a creative way to spread beauty in the world! From my flower loving soul to all of you, thank you for contributing in your own fabulous way! Wonderful news to you all! Awesome opportunity to learn from the master. Cheers!! Wow, the depth of a flower farmer, love it. Thanks for sharing. I felt a common thread in each story as well as my own. From Maine to LA, geographically spreading organic flowers and encouraging good people to grow. Hats off Floret. It is wonderful to see so many derserving and aspiring farmer florists. I wish you all success in striving for, reaching and even succeeding your dreams! All the best. Congratulations to all the winners!! Many colorful well wishes and beautiful smells to all of you and more importantly, have a ton of fun, while you embark on your respective adventures! Great job to Floret’s team who worked so hard to choose 8 lucky winners! Congratulations to the winners! What a wonderful opportunity for all of them. A huge thank you to Erin and the entire Floret Team for offering scholarships to these amazing individuals. I was so excited to see that one of the scholarship winners is from New Hampshire, my neck of the woods. I am so happy and pleased for this opportunity. I will visit next year and Lend my emotional support! I love this post and hope for beautiful things ahead for these deserving winners! Erin and Team, you all are amazing (and deserve a loooong bubble bath). Congrats! Truly worthy recipients. I wish you all fantastic luck! Oh I am so happy for each one of you! I have so been looking forward to meeting each of you and reading your stories really blessed and encouraged me! You all are so deserving of it! Happy journey to all of you and God bless you! Best wishes to all these diligent floret farmers. So excited to see how the flower farming course assists in developing your farm!